It’s no “spoiler” to reveal that, soon after Shades of the Past opens, the Marrable siblings gather to learn the contents of their aunt’s Last Will and Testament. After all, we first meet Lady Gwendolyn in her coffin on the very first page, indeed in the very first sentence of the book. What should follow her interment in the family mausoleum and the funeral feast but a reading of her will? I confess this item was solely the creation of my imagination and research. Yes, I have a fondness for baubles and “sparklies” (ask my husband) and I enjoy pouring through pictures of antique jewelry of all ages. This episode was drawn from my own past and quite real. What now seems an eon ago in 1974, my husband’s job took our young family to Italy where we lived just south of Rome for a time. On one occasion we visited the ancient city of Pompeii. Entering by the cemetery, the Way of the Graves, we made our way through the ruins. 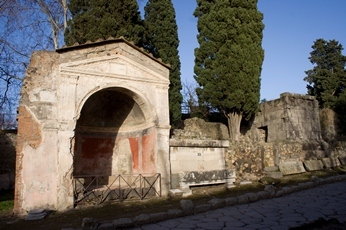 The way of Graves is a section of road connecting Pompeii and Naples. According to the custom, graves were quite situated outside of the city: they are necropolises. On each side of the way rose numerous monuments, tabernae. Hours later, we emerged on the opposite side of the city (evidently the main entrance, I’m not sure why we entered by the graves). Just outside the main gates was a cameo factory. Unfortunately, we’d arrived late in the afternoon at the ruins and had been hard pressed to see all we did. Now we had little time left to browse through the factory or see the artisans at work. We vowed to return, but it was not to be. I’d hoped to purchase a cameo as I have a special love for them. 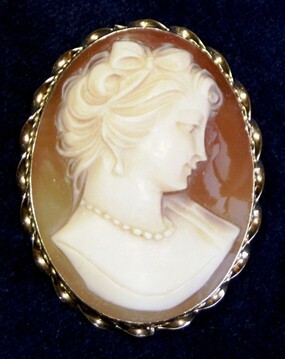 When still in my teens (another eon ago), my mother gifted me with the beautiful shell cameo pin, pictured here. I’ve collected cameo earrings and a few other pieces since then and am enthralled by the high level of skill and artistry involved. Cameo carving — carving in bas relief on hard stones and shells — is an ancient art dating back to Mesopotamia and Egypt. The Romans learned the skill from the Greeks and became highly proficient at it. 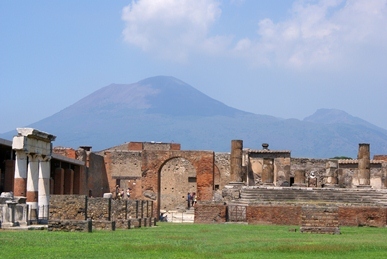 Cameos were even discovered in the archeological excavations of Pompeii and Herculaneum. Naples and nearby Torre del Greco, in particular, remain the centre of cameo craftsmanship to this day. Enjoy this article on the history of cameo carving from Wikipedia. (Great depth of detail and beautiful specimens.) The article also contains external links to cameo collections and artists (at the end). Wow .. thank you so much for this wonderful post - you made me journey back in time when I was six years old with my parents visiting Pompeii, strangely I have rather good memories of it! (my mother said after that, that she should have bought a leash because at the time, she was running forever after me and was afraid to lose me !) At that time It was fun for me as a little girl, like a playground ! Every girl has a souvenir from her grand mother or great grand mother and in fact I have two ; one ring with an oval cameo and a brooche with a round one. The video is really precious !!! Pausing for a Moment . . .